The 19th hole is a luxury townhouse within the boundaries of Ahwatukee, situated in the foothills of South Mountain Park, the largest municipal park in the United States. This is a great area for the adventure seeker, with miles of hiking and mountain biking trails to explore. The home is located in a resort golf course community and around every corner is another golf course just waiting to be played. 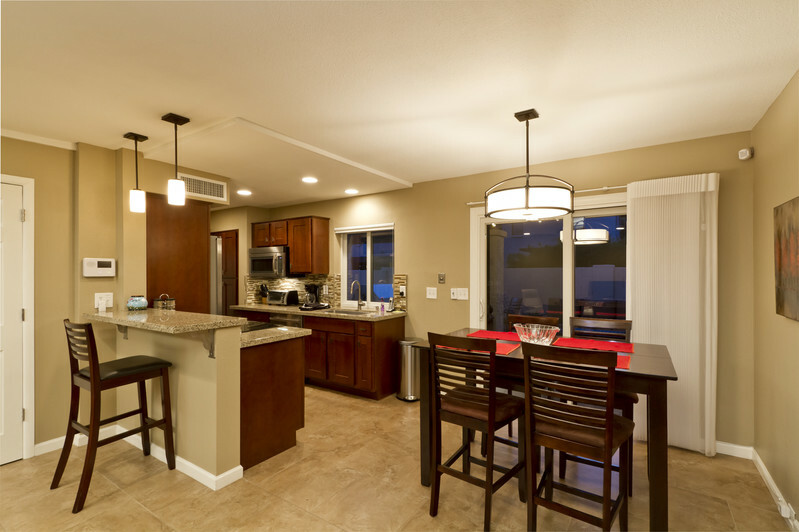 The home was newly renovated in 2012 and is located in the Arizona Grand golf course community at The Pointe South Mountain. The 19th hole is a comfortably furnished 2 bedroom with 1.5 baths. The entire first floor area is covered in wall to wall travertine tile floors. The living room has a comfy sofa for two, and two club chairs. The HDTV has Cable and a sound bar with a subwoofer. The kitchen has recessed lighting, granite counters, breakfast bar with two bar stools, stainless steel appliances, flat top stove, built in microwave and a pub style dining table with four chairs. The upstairs of the condo has two bedrooms, one with a king bed and one with a queen bed. The King room has two bedside tables with lamps, dresser with a flat screen TV and a ceiling fan. The queen room has 1 bedside table and a lamp, dresser with a flat screen TV and a ceiling fan. The remodeled bathroom has a walk in shower with a pebble floor, and bathroom sink with granite counters and a large mirror with excellent lighting. The back patio is a very welcoming and comfortable area to get some sun and enjoy our warm winter days. There is a table with four cushioned chairs and a cushioned sofa with a coffee table. The patio has a large putting green with three different holes, and there is a stone top table with stainless steel gas grill. Truly a home away from home. There's more than just golfing at 19th Hole, enjoy the local hiking and cycling trails, casinos or go for a dip in one of the three available swimming pools. A multitude of restaurants and local Arizona shopping is just minutes away. Would definitely recommend this property - 19th hole - and Signature to others. We had a family issue that caused us to leave a week early and they were more than accommodating. We had a slow coffee maker the first day - tragedy!! - and it was replaced by that evening! The home was exactly as advertised and the staff were very helpful start to finish. The property is in a wonderful location, walking distance to South Mtn. park and the Arizona Grand in a nice, friendly neighborhood. The townhouse was exactly as depicted in the photos. It was very nicely remodeled and decorated with comfortable beds, furniture, TVs, and great outdoor furniture.